I peeled off my gloves and took hold of snow, not on the top of a mountain but just had left at the side of the road in a town along which the houses stood side by side. 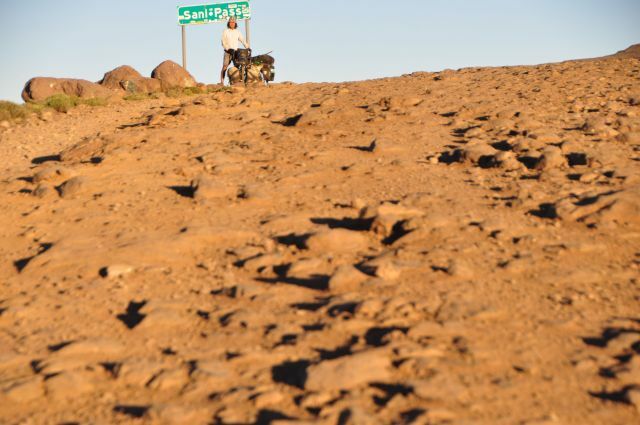 It was about 3.5 years back that I had gotten a same feeling as this moment when I had been pedaling in the Atlas Mountains, Morocco in 2009. In just the same way a snowball had been on the palm of my hand. 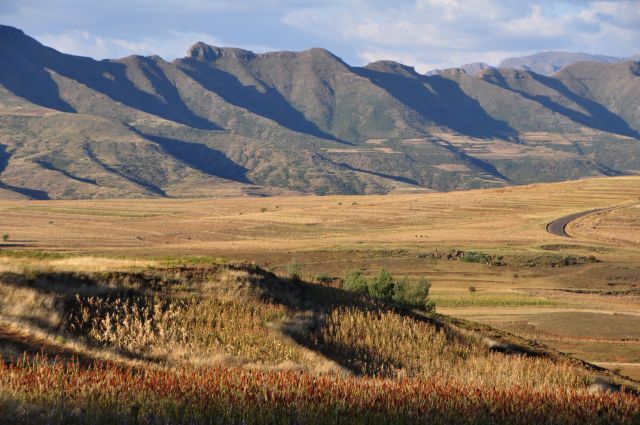 The kingdom of Lesotho is the only country in the world its entire area is located 1,500m above altitude. Particularly, as winter had come it was freezing cold at night especially in the eastern mountain area. (According to the weather forecast the temperature dropped to 12 degree below zero in the coldest night during my stay when I was staying in a village where the diamond mine workers lived.) Thanks for that, the villagers often invited me into their warm huts when I asked them for a permission to pitch my tent. Otherwise they kindly offered their blankets to my tent. The Basotho people (the citizens of Lesotho) were always warm-hearted like their blankets and had been kindly concerned about me. 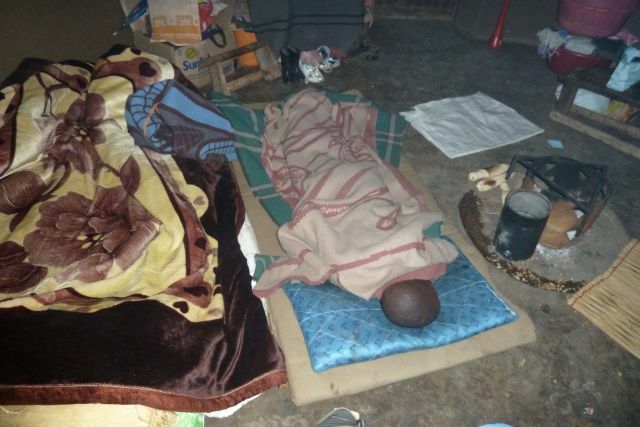 By the way, I have no doubt that no other people in Africa have as much number of blankets as they have. When the sun goes down, everybody came to warm by the fire while wrapping themselves in their blankets, called “seanamarena“. 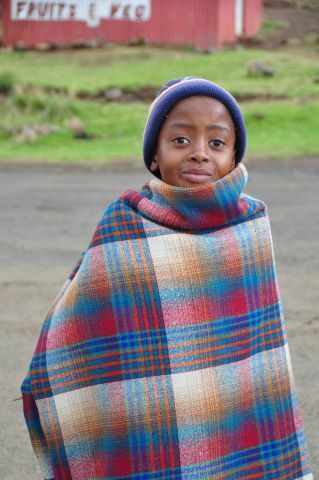 This colorful Basotho blanket nicely keeps themselves warm and it’s normally clipped on the neck to keep their hands free. I really wanted to buy and carry it with me if it was light. 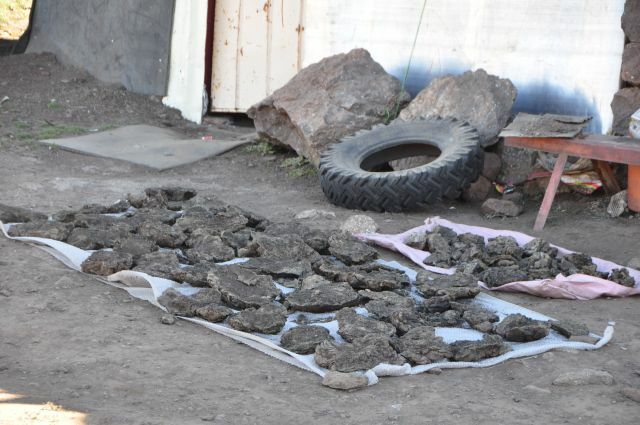 The materials used as fuel for fire differed from one family to another or according to area and location. The price ranges with the products you want to use, firewood, dried cow shits, gas, paraffin, coals. 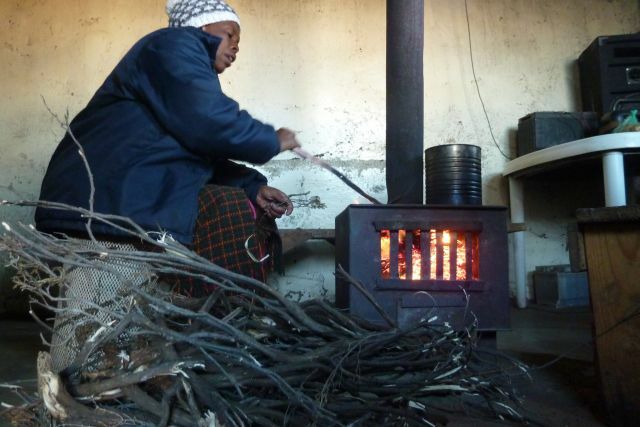 I didn’t know why, but I had never seen people using charcoal for their stoves. 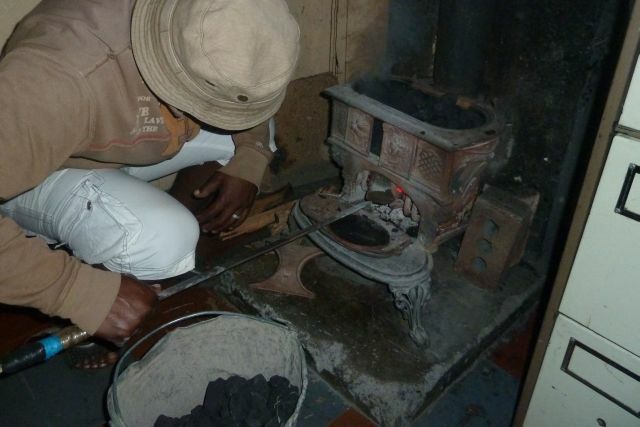 Most expensive but efficient coals seemed to be in common use in a public facility like police stations or hospitals. Those coals were taken from mining in South Africa. They said more than 50% of Basotho males went out to South Africa to find a job in mining or farm and so on. Most of the rest looked after their livestock in the grass field. It was not easy to get a job within the kingdom ranked among the region’s poorer countries. The lowest gears worked without stopping and rotated my bicycle’s tyre everyday. The Drakensberg and the Maluti mountains range in the central and eastern part of the country, with the peaks reaching to more than 3,000m. As long as I can remember, I had cycled across as many as fifteen major pass over 2,000m including four over 3,000m, and of course countless no-named big hill also waited for me on the way. This mountain kingdom was not a place to travel with an overloaded bicycle like mine though I came there with knowledge of that and in quest of that. I cycled up the steep slopes with making S-shaped turns in stages. Fortunately for me, there was no need for carrying much water with me because it was very easy to find a place where melted snow water from mountains dripping off and rivers as well. 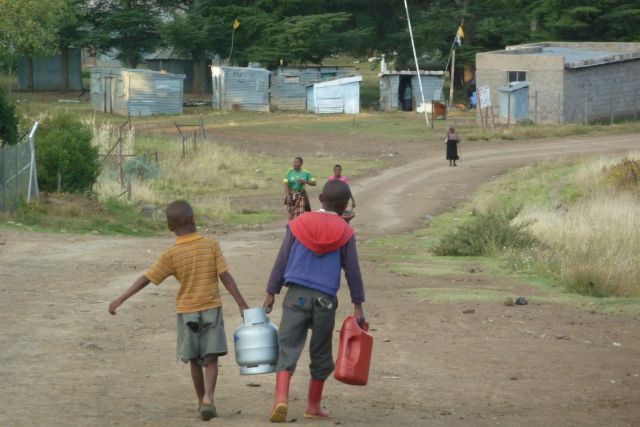 The nation blessed with water resources has built two big dams so far in the country through the Lesotho Highlands Water Project, an ambitious program developed in collaboration with South Africa to provide water to Johannesburg area by tunnels, for which South African government pays approximately 50 millions rand (some 5.6 millions USD) per month. I suppose much amount of water used for people’s life living around Johannesburg and the surrounding dried inland large-scale farms results from this project. As I know there are also serious environmental concerns, it is certain that Lesotho depends largely on exports of water through this project for its foreign currency earnings. I took notice of two things through cycling this country. One was a scarcity of fences. There was almost no fenced-off field unlike neighboring Botswana, Namibia and South Africa. 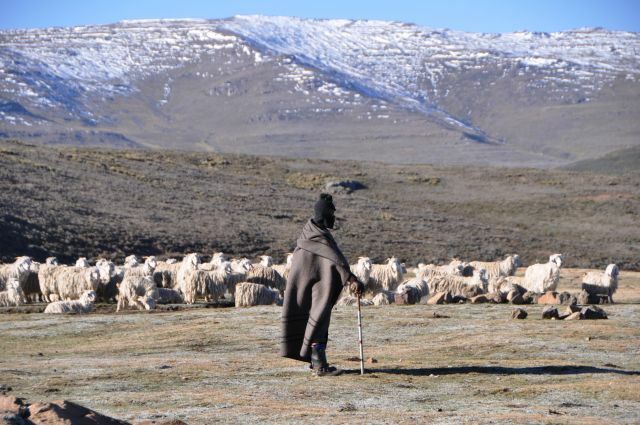 Shepherds were walking freely in a vast expanse of grassland without landlords with a number of sheep. Landscape was much more open and magnificent. 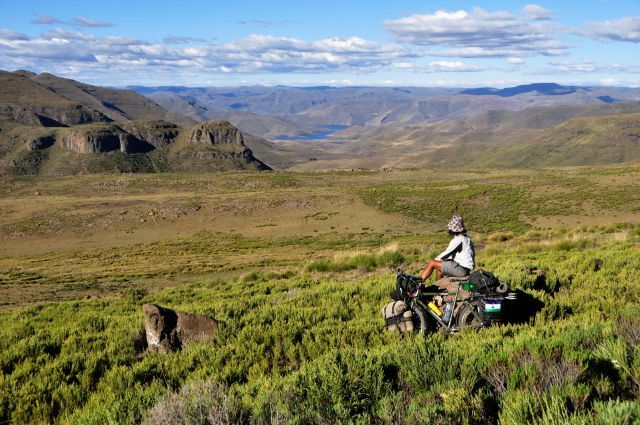 The other was the small number of bicycle riders due to its unprecedented mountainous geography as described above. 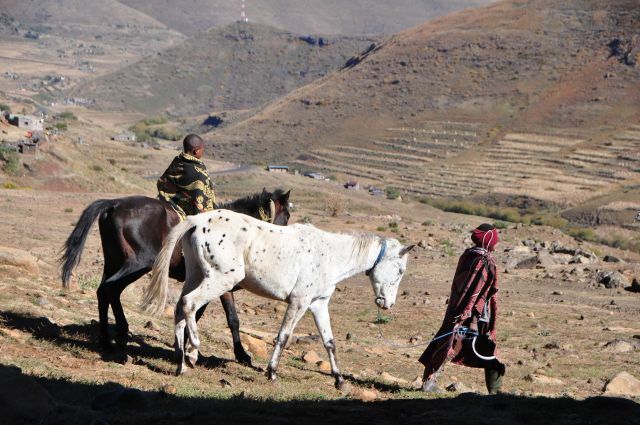 It was not bicycles but horses or donkeys that the Basotho people were usually taking a ride on. They had a good seat on a horse and donkey to go up and down even a sharp cliff. I had barely seen a person riding a bicycle except in Maseru, the capital town in lowland. I visited the only specialized shop for bicycles in the capital town or probably in the whole country. 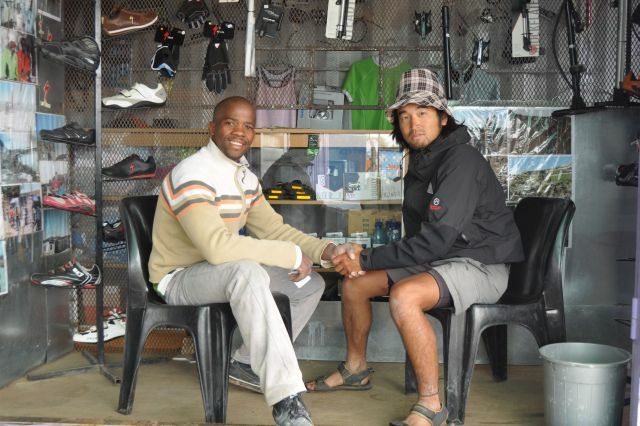 The owner of the shop, Tumisang, was a prominent cyclist in Lesotho who had been also active internationally. He sent for the secondhand bicycles and its parts keenly from his friend in America and sold them after fixing by himself. Against my expectation, he said it doesn’t take much a long time for the bicycles to have been sold out. Not that ordinary people didn’t need but just they couldn’t afford it, I knew they wanted a bicycle. The following month 450 secondhand bicycles were supposed to be donated to his shop by the American friend and then he was going to give them to the children, who wished to have a bicycle, living in the remote area far from Maseru, he told me. To my surprise, there were even some mountain bike races in the country. 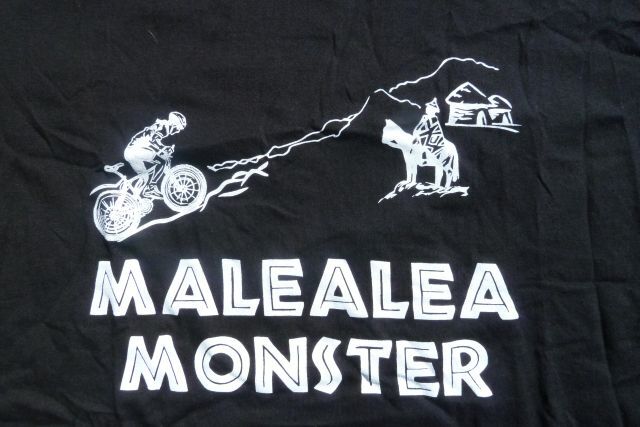 ”Malealea Monster” and “Lesotho Sky” were two of them and both were annual event, started in 2011. The former one had been organized in April by Malealea Lodge, well known for the pony trekking centre. The number of participants of the latest race, held just a few days before I arrived, was 62, double number of the previous one, but just with 5 participants in the first year. The number had been increasing consistently ever since it started. For regional promotion, they would continue without regard for commercial concern, the owner of the lodge told me. In this connection, the latest winner was indeed Tumisang. It seemed the seeds for the cycling-culture in this mountain kingdom had been steadily scattered. “Number fifteen”, I reached the Sani (alt. 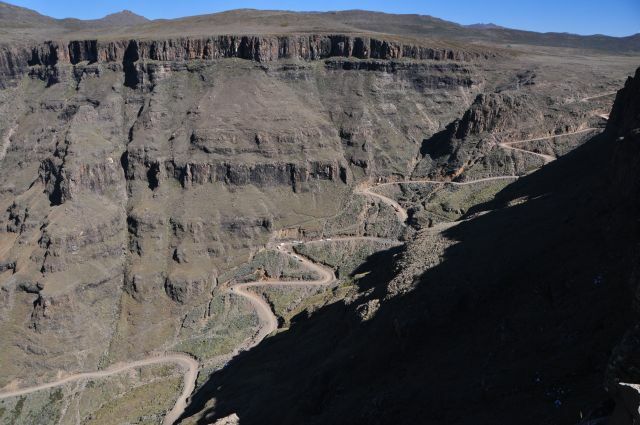 some 2,900m),the last pass for me in Lesotho, where the kingdom shares a common border with South Africa. Then a tempting sound reached my ears. 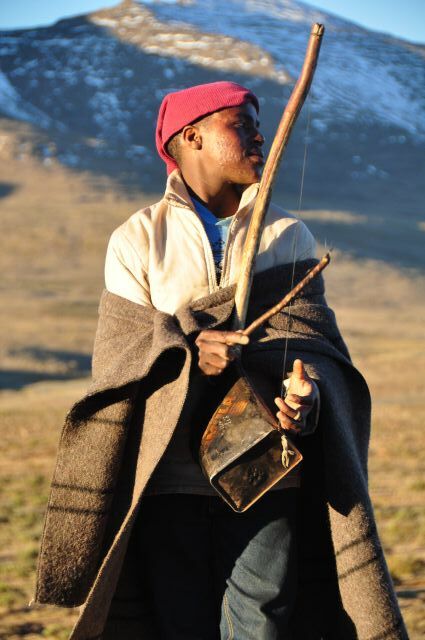 A young shepherd was coming to close from the front of me on the right with playing “mamokhorong”, a violin-like traditional Basotho instrument, the hair of horsetail stretched on its bow, I had had the three opportunities by then to listen to the tune while crossing in the mountain area. Each time, I had stopped pedaling and attentively bent my ears. With note of my existence, the shepherds routinely had given me a performance for themselves. And no exception for the day, a tune of his mamokhorong resonanted into the evening sky, dominated by snowcapped mountains. I perceived muscle of my foot quivering in response to it. My body was supported with the legs seemed to be strongest in my cycling career then. Day after next, I cycled down a steep slap had continuous hairpin curves at quite a slow pace with gripping brake levers with all my force. I got to bottom of the pass in safety and passed the immigration control. The large-scale farms with huge sprinkler machine and barbed-wire fence set up on the either side of the road made me realize that I came back to South Africa. I looked up at the lofty mountains soaring like spears sticking through the sky. An alluring melody of mamokhorong couldn’t come to flow down into the lower world. The kingdom, floating just right over the massive Drakensberg walls was actually too far off at that moment.